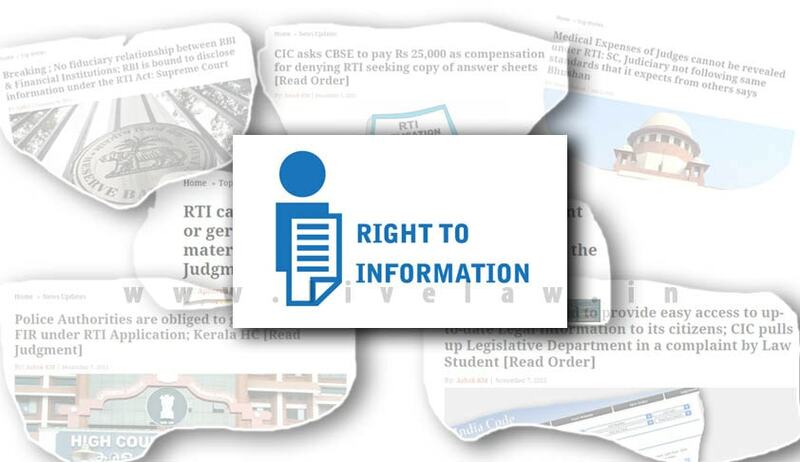 Nation celebrated the 10th Anniversary of the Right to Information Act in 2015. This year witnessed some landmark as well as regressive orders from the Constitutional Courts, Central and State Information Commissions on Right to Information. LiveLaw has reported almost all important verdicts. Here is a list of most significant RTI Verdicts from Supreme Court, High Courts and Central Information Commission. Supreme Court in a landmark decision (Reserve Bank of India v. Jayantilal Mistry) declared that RBI does not place itself in a fiduciary relationship with the financial institutions because, the reports of the inspections, statements of the bank, information related to the business obtained by the RBI are not under the pretext of confidence or trust. Writing the judgment for the bench, Justice M.Y. Eqbal, expatiating on the nature of functions of the banking sector regulator said: “RBI is supposed to uphold public interest and not the interest of individual banks. RBI is clearly not in any fiduciary relationship with any bank. RBI has no legal duty to maximize the benefit of any public sector or private sector bank, and thus there is no relationship of ‘trust’ between them. RBI has a statutory duty to uphold the interest of the public at large, the depositors, the country’s economy and the banking sector. Thus, RBI ought to act with transparency and not hide information that might embarrass individual banks. Supreme Court of India in Subhash Chandra Aggarwal vs. Registrar General, Supreme Court of India held that the medical expenses of Judges are not qualified to come within the ambit of the Right to Information Act. The Apex Court rejected an appeal against Delhi High Court decision which had held that information about doctor’s visit expenses of judges and their families can’t be revealed. Delhi High Court in Subhash Chandra Agrawal v. Office of AG held that the office of the Attorney General of India is a public authority under the Right to Information Act. The Court decided the same while hearing a writ petition filed by RTI Activist Mr. Subhash Chandra Agrawal, which was against the order passed by full bench of CIC wherein the Central Information Commission had held that the office of Attorney General was not a public authority under the RTI Act. A division bench of Kerala High Court comprising of Chief Justice Ashok Bhushan and Justice A.M. Shafique in Jiju Lukose vs State of Kerala held that the police authorities are obliged to provide the copy of the FIR on an RTI application, unless an appropriate authority decides it is exempted under section 8 of the RTI Act. The Central Information Commission in Vijay Kumar Mishra v. CBSE directed the Central Board of Secondary Education (CBSE) to furnish the copies of answer-scripts sought for by the father of a student, and to pay a compensation of Rs.25, 000 to the parent for harassing him and compelling him to sign illegal undertaking to give up rights. The Information Commissioner also issued show cause notice to then CPIOs of CBSE who refused information sought for. Rejecting the grounds on which the CBSE denied the natural guardian from exercising his legal duty to secure the legal interests of his son including his right to information the information commissioner Prof. M. Sridhar Acharyulu said “The CBSE has no authority to impose such restriction on the rights of minor and his guardian.” The Commission also directed the CBSE to put in place such system with conducive practices by which the Right to information is not limited but facilitated, by removing the obstacles such as undertaking to give up their legal rights. Central Information Commissioner M Sridhar Acharyulu in S.N.Shukla v. Department of Justice directed the Department of Justice on 7.1.2015, to disclose the Union Cabinet note and details about its decision to establish National Judicial Appointment Commission.The Department of Justice had refused reasoning that it was a cabinet secret and was exempted u/S 8 (1)(i) of RTI act. Chief Information Commission has in Vansh Sharad Gupta v. PIO Legislative Department held that State has a duty to inform citizens about the Law as and when it was made and the citizens also have right to know of the Law. This observation by the commission was made by Information commissioner Prof. M. Sridhar Acharyulu (Madabhushi Sridhar), in a complaint filed by a law student from National Law School of India University, Bangalore. CIC also ordered to pay Rs.10000/- as a token compensation to the library of the National Law School of India University, Bangaluru, for causing loss of time of several law students.